In the last year I have had the opportunity to understand both the context of human rights work in Colombia and more specifically the context of IELCO (Evangelical Lutheran Church of Colombia) in working for human rights. The role I can play has been more deeply defined throughout many conversations with the people of IELCO about their dreams, fears and experiences regarding human rights. and/or experienced sexual violence during the conflict. Curtis, John and Ivonne looking at the memorial. A few of months ago I started a consultation process, asking all of the congregations of IELCO how they would like to work with the human rights program for the next year (2016). Through this process, five congregations were chosen to be accompanied throughout the year, and each congregation will be focusing on different human rights themes. This will be done through a unique series of workshops at all five congregations (based on the theme chosen by the congregation), the creation of materials such as guides and manuals for the local congregation to continue teaching the theme, as well as an asset-mapping process to help each local community define for themselves their own strengths and resources to develop their capacity to work for the protection and promotion of human rights. Some of the themes chosen for next year will be: The bible and human rights; Transformation of conflicts and political advocacy; Community justice; the rights of the child; and the right to education. decided to keep them both together in a park to remember the history. Photo by Yvonne Rosenstand. The process started by reaching out to all pastors and presidents of congregations and asking them to talk to their members and decide on a theme. After they got back to me with a theme, they then decided on how they would like the human rights program to accompany them (workshops, advocacy, materials, other activities, etc.). After the theme and type of accompaniment was decided, I then met with the congregation to make everything concrete: what will be the objective to be reached by the end of 2016, what are the dates for activities, who will be participating (from inside and from outside the congregation), as well as just getting to know the hopes of the people. This last weekend, the 28th and 29th of November, I finished the planning process with the last of the five congregations. It was actually my first time visiting the community in Medellin (the second largest city in Colombia), and was a fantastic way to start the relationship. Pastor John Hernandez, a constant and solid supporter of my work and of the human rights program, had done a great amount of preparation and the process was very strong. Pastor John Hernandez leading the service on Sunday. Photo by Katie. The Comuna 13, is a neighborhood of Medellin that has a sad history of violence and drug trafficking, as well as a history of community led non-violent resistance and organizing for peace. Pastor John took us to visit a youth group from the Comuna (Commune, used to divide the city, almost like councils in the U.S.) called Judah, that focuses on art and creativity. 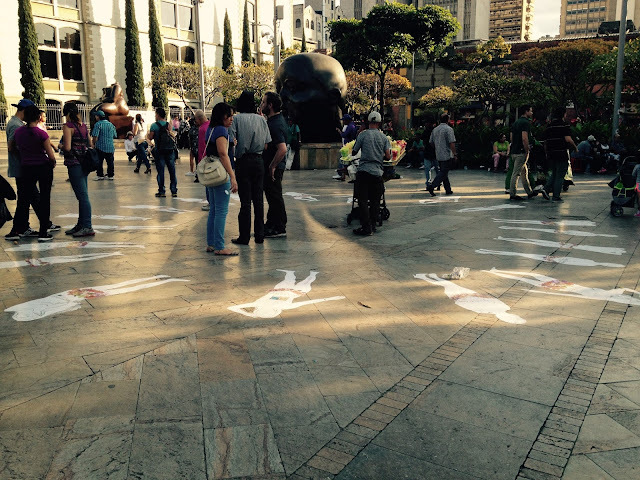 The members of this youth group shared some of their experiences living in the Comuna and their work of using art as a form of resistance, of recording the truth and promoting justice. We then had a small workshop about human rights and the bible and invited them to participate in the process next year. Meeting with the planning group from the church, making all the plans for next year. Photo by Katie. After the service on Sunday, I met with a group from the church to plan out next year in detail. This group showed an enchanting excitement to get involved in human rights issues. 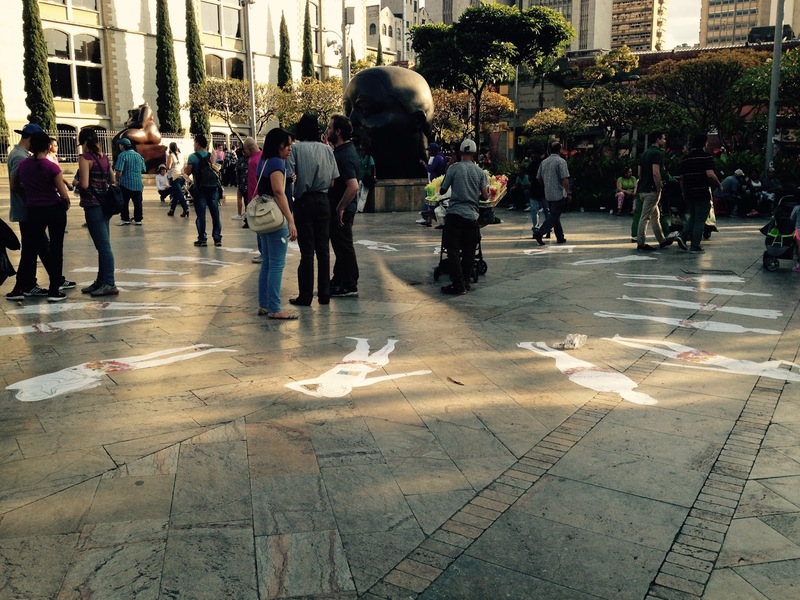 They especially wanted to focus on those that are most vulnerable in Medellin, and ultimately decided to focus initially on human rights more generally, and later in the year, on the right to education. 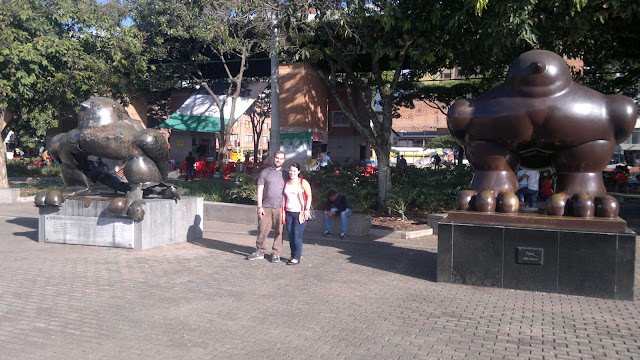 Afterwards, Pastor John, with his family, took us around the city of Medellin to see it a little more, know some more of its history, and enjoy the much warmer climate, compared to Bogota. Pastor John and Yvonne (his wife) at the festival of lights, an annual Christmas celebration in Medellin. We were told not to miss it. Photo by Karina Rosenstand.